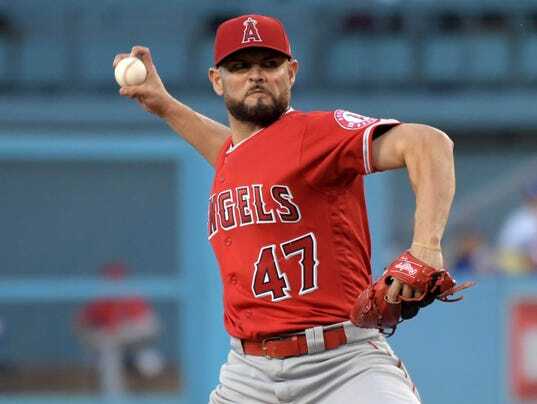 LOS ANGELES (AP) — Ricky Nolasco pitched into the seventh inning to pick up his first win in almost exactly two months, Yunel Escobar drove in two runs and the Los Angeles Angels snapped the Dodgers’ 10-game winning streak, 4-0 on Monday night. Nolasco (3-9) gave up five hits while striking out five and walking two in 6⅔ innings. He left the game after getting hit by a line drive by Enrique Hernandez. Nolasco was 0-7 in 10 starts since beating Oakland on April 27. The Dodgers also ended a streak of 17 consecutive games with at least one home run, which was tied for the longest stretch since moving to Los Angeles before the 1958 season. Their franchise record is 24 consecutive games set by Brooklyn in 1956. Danny Espinosa had a sacrifice fly and Martin Maldonado added a solo homer to help the Angels win for the fourth time in five games. Dodgers starter Rich Hill (4-4) gave up three runs and four hits in a season-high seven innings, striking out seven and walking two.